^ The Transitional Constitution of the Republic of South Sudan, 2011. Government of South Sudan. [12 July 2011]. （原始内容存档于2011-07-21）. Part One, 6(2). 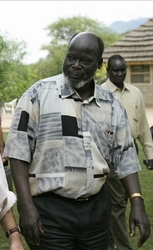 "English shall be the official working language in the Republic of South Sudan". ^ At a Glance. Official portal. Government of Southern Sudan. 12 July 2011 [24 July 2011]. （原始内容存档于2011-06-28）. ^ 4.0 4.1 4.2 4.3 South Sudan. World Economic Outlook Database. International Monetary Fund (IMF). April 2016 [2016-06-22]. ^ .ss Domain Delegation Data. Internet Assigned Numbers Authority. ICANN. [2011-09-01]. ^ New country, new number: Country code 211 officially assigned to South Sudan (新闻稿). International Telecommunication Union. 14 July 2011 [2011-07-20]. ^ 南蘇丹共和國獨立順應民意利於和平. 國際在線. 2011-07-10 [2011-07-11]. ^ 澳報：北南關鍵問題分歧大南蘇丹立國易路坎坷. 新華網. 2011-07-11 [2011-07-11]. ^ Sudan: Over 4,000 Ethiopian Troops for Abyei Peace Mission. AllAfrica.com. 27 June 2011 [8 July 2011]. ^ 脆弱国家指数揭晓 南苏丹居首中国排第68. BBC中文网. 2014年6月26日. ^ 15.0 15.1 Southern Sudan: About At a Glance. 南蘇丹政府. [2011-07-11]. （原始内容存档于2011-06-28）. ^ Southern Sudan: About. 南蘇丹政府. [2011-07-11]. ^ New capital city for South Sudan?. Radio Netherlands. 6 February 2011 [24 July 2011]. ^ South Sudan to establish a new capital city and relocate from Juba after independence. Sudan Tribune. 6 February 2011 [24 July 2011]. ^ Christie, Sean. South Sudan brushes fear aside. Mail & Guardian. 8 July 2011 [24 July 2011]. ^ African Union Welcomes South Sudan as the 54th Member State of the Union. 27 July 2011 [31 July 2011]. （原始内容存档于2011-08-12）. ^ El-Husseini, Asmaa. Hoping for the best. Al-Ahram. 7 July 2011 [8 July 2011].